Yahoo! The climb and assault on Mt Humboldt was successful for the Old Goats Dxpedition team of wG0AT, sherpas Rooster and Peanut, and myself. The wx was clear but the wind was persistent for the three days we were in base camps or on the mountain top. For a more in depth story, go to our dedicated blogsite for this Colo-14er ham radio event and follow the links to the videos of our base camps and HF and VHF operation from the 14,064' mountain top, in spite of the 40+ mph gusty winds! In one week, the Old Goats DXpedition team (including Rooster and Peanut!) is off to participate in the 2009 Colo 14er "special event" hamradio (see http://www.14er.org/ ) activation of Humboldt Peak (14,064') this August 9th using our 2008 callsign of N0B. After setting a "first" for a QRP HF out-of-state, 14er-to-14er qso in 2008 (Mt. Whitney, CA to Uncompaghre, CO), this time we hope to make a 3-way, summit QSOs between Mt. Shasta, Mt. Langley (both in CA) and Humboldt Peak in CO. The Colorado team of Steve/wG0AT and Guy/N7UN will hike into a 11,000’ base camp on Friday and setup QRP antennas for Friday and Saturday radio fun. Then at 4 am MDT on Sunday we will start the summit climb of Humboldt with a goal of an 8 am MDT summit activation using the special event callsign N0B. At the same time, Brian/N6IZ will climb Mt. 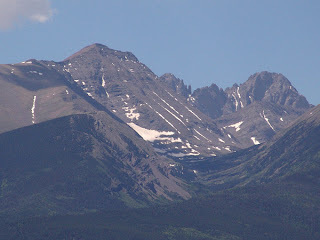 Shasta (14,162') and Mark/AF6AX will be climbing Mt Langley (14,062'). Guy/N7UN will be carrying a portable APRS unit (see http://aprs.fi and use N7UN-9 for the SSID) for near realtime route tracking. Anybody that might be interested in participating even if its basecamp activities in support of the climbing teams, please contact Guy/N7UN. Look forward to working you from the summit on 14.060, 14.342.5, and near the 2m/440 calling frequencies.